The Franziskanerkirche is located at the end of Sigmund-Haffner-Gasse, corner Franzikanergasse and connected to the Residenz Castle. The origin of the current church is unclear, but probably lies in the time of St. Virgil, who might have used the church for baptisms. There is record of a parish church on the site from 1139, but this building was destroyed in a fire in 1167. The main nave of the current Franziskanerkirche was built in late-Romanesque style in the early 13th century and therefore, it is among the oldest buildings in Salzburg. The main gate facing Siegmund-Haffner-Gasse was decorated in Baroque style around 1700. On the right side of the gate you can see a stone-carved hand that is held in a position like swearing an ore - there are two stories connected to this hand. The one tells us that the mason responsible for the gate had to swear to build no other gate like this in his life; the other story relates the hand to the fact that refugees and persecuted people could find shelter and protection within the church. The interiors are mostly Gothic, with the main altar designed by Salzburg′s most famous sacral artist Fischer von Erlach. In the early 17th century, the arches of the choirs were filled with side chapels, giving elaborate examples for Baroque style that was imposed on previous Gothic structures. Despite of being built around the same time, the chapels display very individual decorations. One of the first chapels in the Franziskanerkirche was the Karl-Borromäus-Kapelle left of the main altar. It was donated by Markus Sittikus. It is followed by the similar Geburt-Christi-Kapelle ("birth of Christ Chapel") and the Rochuskapelle ("Rochus Chapel") with beautifully linear and clear stucco decorations. 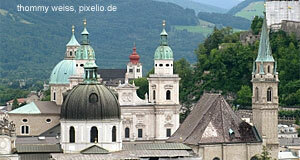 It was built in 1625 to protect Salzburg from the plague. The fifth chapel is the Dreifaltigkeitskapelle ("Trinity Chapel"). It is twice as long as the others and its altar dates back to 1561. Before it came to this chapel, the altar was in the cathedral. The last two chapels are the Annakapelle ("Anne′s Chapel") and the Franziskuskapelle ("St. Francis Chapel"). The latter one has an orange background ans was donated by Prince Archbishop Johann Ernst Thun in 1690. The paintings of the Franziskuskapelle display scenes from the life of St. Francis and were made by Johann Michael Rottmayer. The angel statues and stucco work were done by Ottavio Mosto. The Franziskanerkirche is connected to the abbey in the Franziskanergasse through an arch spanning over the road. The side gate has late-Romanesque decorations, displaying Christ between St. Peter and St. Rupert.